The following will be a multi-part publication of the STRENGTH BODYBUILDING course. This next section will cover the Beginner Routine and 8 Week Strength Bodybuilding Course. While this course is meant more for the intermediate to advanced trainee, there will be some beginners too, so if you’re new to training then this section is for you. This section is also good for trainees who have been out of heavy training for a long period of time and who need to get back into training shape. If there are any specific exercises which you cannot or will not do (for whatever reason), please refer to the “Special Considerations” section for ideas on alternatives. If you require familiarization with the exercises mentioned below, please refer to the TRAINING page. The first week of this cycle will involve “testing” yourself to establish rep and weight baselines. The second week will involve increasing stability & volume, the third week will emphasize auxiliary work, and the fourth week should emphasize strength and should be the toughest of all weeks. The fifth week will be a rest week. To elaborate on the below, each exercise will denote the number of sets and reps done. If an exercise is followed by “1×5”, that means that you are to do 1 set of 5 repetitions for that particular exercise. Good exercise form is a must for this stage. While “loose form” training is actually beneficial to gaining size and strength, the basic phase is best left for learning how to master exercise form. More on loose form training will be covered in the “Expanding on this course” section. The goal of this week is to establish an estimate of the amount of weight that you will be using throughout the cycle. Each set will be preceded by a thorough stretching warm up. Additional warm up sets would be mentioned below. While you may use different exercises during subsequent auxiliary and strength weeks, you should include certain “core” exercises each workout to ensure continuity. Grip Hangs: 1 minute maximum- add weight if necessary. This exercise would best be done using a thick bar. Using the above assessments, estimate to the best of your ability what you feel you might be able to do at the end of this training cycle (week 4). In this week, you’ll increase the volume of training to get a more thorough workout and to emphasize lower reps ranges (for strength). 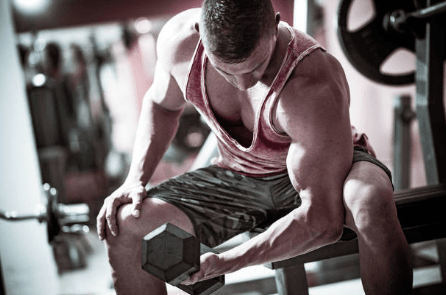 You will use an estimated 90% of the weights that you’ll be using in week 4. During this week, you will train in the attempt to fulfill your short term goals for this cycle. This week is particularly special, in that, after each exercise, you should estimate to the best of your ability how much more weight you think you may have been able to do above the current workout. You would then note that difference, and that would become the next cycle’s goal. An example: If you were able to do 200×3 in the bench press, and felt that you could have done up to 210, then next cycle’s end goal for the bench press will be 210×3. The same also applies in the other direction. If you went for 200×3 but were only able to do 200×2- though you felt you could have gotten at least 195×3, then the next cycle’s goal would be 195×3. It’s vital that you’re honest with yourself in these assessments if you hope to make true progress. Regardless of whether you plan to compete professionally or if you just like to lift heavy, your most important competition is with yourself. Cheating yourself will only result in a lack of true gains or even injury. During this week, you should take the opportunity to not only rest your body, but your mind as well. Use this time to partake in light, enjoyable exercise like walks, easy swimming, and “fun” activities that don’t remind you of your training. This will ensure that you are fresh and motivated for the next training cycle. The following course is meant for trainees who have at least completed some for of basic phase, and are preferably the domain of intermediate and advanced trainees. This phase is composed of a “double cycle” of four weeks in length each. You can choose to continue this type of training, if you like; but please review the “Conclusion” section for notes on how to continue using this type of training with good effect. On some weeks, the reps will vary a bit even for the core exercises. During your first cycle, you can estimate what your weights will be for different rep plans using the following software. After your first cycle, you can get a much better idea of what type of weights for each rep plan you’ll be able to use for upcoming cycles. As stated in the Beginner Routine outline, if there are any specific exercises which you cannot or will not do (for whatever reason), please refer to the “Special Considerations” section for ideas on alternatives. Weeks 1 & 5 are to be done with weights that are 90%, and weeks 2 & 6 with 95% of your Weeks 3 & 7 goals (respectively). Weeks 3 & 7 will be used to assess the goal weights used for the upcoming cycles. This week, you’ll focus on any auxiliary work to bring up what you think are any “weak point” in your training or muscle groups. While this routine isn’t big on excess isolation work, there may be some lagging body parts that you may wish to bring up. During this phase, you will estimate and note potential goal weights for your upcoming cycle based on how you do during your target sets. While you can choose different exercises for the auxiliary and strength-specific cycles, you should stick to the core movements each session for continuity. Strength specific movements may involve using “partial” reps or plyometric style exercises. These exercises can be very taxing on recovery, but this being the last week in the cycle will enable you to fully recover and even benefit from a potential “rebound” effect from using these high intensity methods. During this period, you should capitalize on your time off and take it easy. Light cardio maintenance and pleasant play-type activities are recommended. Some trainees have noticed that they can induce more size if they add a “pump set” at the end of their bodypart sessions. This is normally done shortly after the last set is performed with a weight that’s light enough to perform about 15-25 reps. This pump set would be followed up immediately with a PNF stretch to take advantage of the pump that’s induced. If you’re interested in giving this a try, we recommend experimenting with it for a few weeks to see how you respond. Note that if you’re training close to your limits of recovery, adding an extra set might actually set you back in the long run, so monitoring your reaction is highly recommended. After week 8, it might be best to take some time to change things up for variety, even if just for a few weeks. After two to three weeks of higher rep work, an intense sport or calisthenics can help refresh you while keeping you in shape, and it’ll allow for full recovery should you decide to repeat the routine again for a full term. You should also consider conducting your training in phases. Even if you’re after massive size and strength, you should leave some parts of the year for lighter or different types of training to allow for full recovery and to alleviate boredom. This is especially the case if you have added a large amount of size and strength. The other aspects of your fitness like cardiovascular endurance, flexibility, agility, etc. should be allowed some time to catch up. You might even decide to do a “definition” phase once a year to trim off the fat and reveal your hard earned gains. According to lore, bodybuilders like Arnold Schwarzenegger were well known for advocating “cut” cycles after gaining 20 pounds of mass at a time. There are some things that I had to find out the hard way about training. One was that a lot of the advice that you’ll get from magazines about routines by professionals are not applicable to most trainees. The concept of rest, training form, the number of sets and exercises are some others. By accident, I found that the best results were often had by doing less and resting more but by ensuring that the work you did was INTENSE. You’ll note in the routines that you’re not asked to do a particularly large number of sets. This conflicts with most of the types of routines out there some that can have you doing over a dozen sets for even small bodyparts. The catch is, the sets that you do are going to have to count, and apart from your warm ups, they should be within the percentile range of that specific training microcycle. In the gym, you’re not going to go there to waste your time with light weight training or with excessive half-pyramid style regimens. You’ll note that the lightest phase apart from the test week is set at 90% intensity. On the flip side, when you’re not training, you should rest. Even with the above parameters, this routine isn’t set in stone. Some tweaks to it might be recommended in order for you to allow yourself to reach your full potential. Regarding the number of sets, most trainees will have the potential to increase their strength by 300% or more, but their recovery ability by only 50% or so. This poses a problem once you get to high levels of strength. 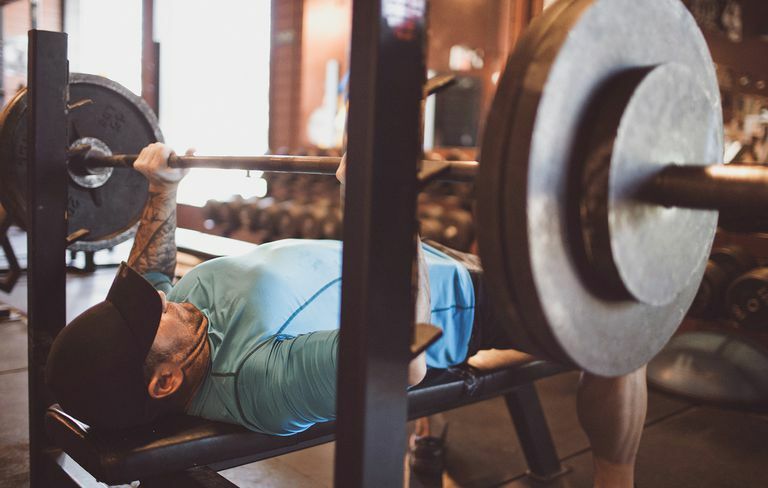 You may go through a period where you can tolerate and even benefit from doing a few more sets, but as your strength goes up, the total damage done to your body in one training session increases — sometimes drastically. Once you pass that curve, you will need to reduce the number of sets that you do in order to allow enough recovery resources, not just for recuperation, but for overcompensation (growth) as well. You may also find yourself needing to increase your days in between bodyparts. Currently, during the tail ends of some of my cycles I find myself having to take 2 weeks in between specific targeted bodyparts in order to allow for recuperation/strengthening. I discovered this necessity by accident. For many years I trained in a fashion where I did not allow more than one week to elapse between bodyparts. As I got older and my various responsibilities increased, there were times when training successfully just wasn’t an option. As I started allowing for more rest days, a curious thing happened. I noticed that some of the nagging injuries that I had started to dissipate, and my weight that was stuck at about 240 started to climb, as did my strength. This was done with NO other change than allowing for more rest days! It was then that I started taking a more proactive approach in ensuring rest. The above is NOT an excuse to be lazy. YOU will need to find the patterns that allow you to make the most gains in minimum time. If you abuse the rest process, you will not only slow down your gains, but you’ll become inefficient at the exercises themselves. Only by testing and keeping accurate records will you be able to discover the training trends that work best for you. About exercise form: as a beginner, it’s important that you train with strict form to A) learn the mechanics of the exercise, and B) protect yourself from injury. As you gain in strength and experience, you’ll discover that by loosening your form a bit that you’ll be able to handle a lot more weight, and that translate to more strength. As a side benefit, you also vastly strengthen a lot of the ancillary muscles involved in the movement as well as the tendons, ligaments, and bones. Again, the key to success with this technique is in doing it correctly. Loose form is not an excuse to use more weight than you’re ready to use, and it’s not an excuse to cheat yourself out of strength gains. In the next and last edition of STRENGTH BODYBUILDING, we’ll go over the Bonus- Shock Routine (“Add Up To ½ Inch+ To Your Arms With One Day’s Training!”), FAQs, and Conclusion.